The Indiana Jones-meets-Wolf of Wall Street reality that is dealing in Venezuelan debt instruments. It’s days like February 10th, 2015, that keep me in this business. To a casual reader, the news weren’t anything earth-shaking that day. Oil was finally showing a bit of life, reaching 52 $ a barrel. The government announced yet another alternative FX system called Simadi, and BCV was promising a press release. But I’m a Venny Trader – a full time PDVSA and Venezuela Sovereign bond trader – and I could feel the buzz in the air that day. To be clear, trading VENZ is to normal bond investing what mixed-martial-ats is to thumb-wrestling. 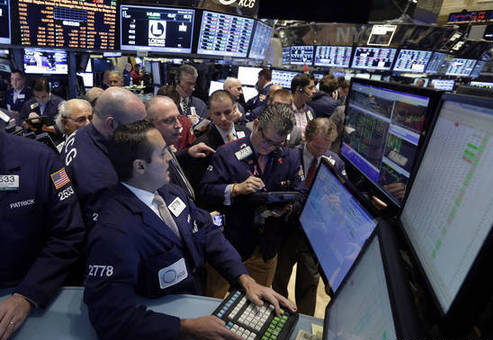 It’s a crazy, high-risk world where a good day in the WTI oil market, or a couple of anodyne bureaucratic announcements, are enough in to set off a mad bull-rush, with venny traders tripping over one another to snap up paper. There was almost no supply, but we managed to grab hold of some PDVSA bonds. The rest of the Street was also in buying mode, to our amazement; they claimed it was institutional demand, but there was no way to tell. But one thing kept bugging me. This one trader seemed kind of doubtful about the whole operation: a big Wall Street player with competitive prices, but also a cool person to talk to. Just minutes before the event, out of the blue, he sent via his Bloomberg Terminal a blast message: SELLER 15 MM VENZ 26 PRE-PRESSER. That caused quite a stir and put the rest of the market on sour mode. A couple chatrooms on the Terminal were asking if we were watching the Press Release with Merentes and Marco Torres. And boy, were we! It didn’t take long to realize we were in for the same chavista BS we’re way too used to: Simadi was sure to be another another flop. Just a new name for Sicad. Then came that sinking feeling in the pit of your stomach: we were sitting on a ton of PDVSA 22s that were milliseconds from tanking. We needed to get rid of them fast, now, before they became toxic. Of course, everybody else in the market was thinking the exact same thing. One thing anybody who dabbles in this market learns real quickly is that VENZ are extremely one-sided assets. Either everybody’s a buyer or everybody’s a seller. No wonder the market’s so volatile! The polite term for this is a ‘high beta’ asset. That means that this asset’s price volatility is extremely high compared with, well, almost every other asset you can get your hands on. The volatility is so high in VENZ that regular pricing conventions in Fixed Income just don’t apply. And it makes sense: what’s the point in quoting these bonds in yield terms, when a single day’s change of price can account for several months of interest in either direction? Consequently, this asset class attracts a special community of traders around it. When you think about Venny Trading, it helps to first forget everything you thought you knew about bond markets: this is no boring, stable market with liquid and transparent trading conditions. VENZ/PDVSA is mainly characterized by Over-The-Counter action (as in, no regulatory oversight, no central clearing, no guarantees… you get the point) on the Street, the guild of investment banks located in New York City that act as market-makers. They are joined by a web of inter-dealer and retail brokers, whose purpose is to bring some clarity into the market by matching buyers and sellers (in return, taking a slice of the trading flow they help to create). Finally, there’s the end customers: a mix of US and European Investment Funds, private banks, and a small group of banks based in Venezuela that participate in the market trading VENZ/PDVSA bonds. I belong to the last group since 2013. Everybody knows the VENZ/PDVSA market is a guillotine. It feels rigged against end-clients almost by design. It’s extremely easy to lose money in Vennieworld. First off, there are those outrageous transaction costs (which may amount to 3% of the invested amount, per trade). Second, there’s the out of control volatility: seriously, 5% moves in a single day aren’t for the faint of heart! Third, there’s the liquidity, or rather the lack thereof: it’s usually impossible to trade bonds without moving the price against you. Sometimes, you can’t trade them at all. Every time I try to buy or sell a bond in this crowd, I know I’m swimming with sharks. Or playing a hand of poker with the Mafia. Why come back for more, you ask? Because I’m hooked on days like February 10th. 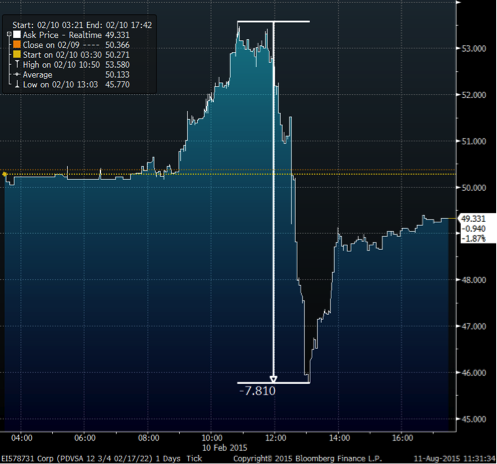 To give you a sense, here’s the intraday chart that day. The press release ended at (you guessed it!) 12pm New York time. Before that, bonds rose non-stop for two hours and never looked back. From then, though, it was just a matter of minutes before the bonds started their freefall. We were way too heavy on bonds and the army of buyers suddenly disappeared. We got a final customer arriving at 12:04pm. Our savior. He was a broker-dealer looking for ‘size’ in a bond that we were in fact owning at the moment, and we sold him half of what he wanted from our inventory, and the other half ‘short’. We were able to buy back the bonds 1 point cheaper in less than 5 minutes! Boy, if we had waited… And after that, we had to sell off in masse our other holdings of bonds, before they made us lose money. At the end of a very tiresome day, I wrote to the street guy who was selling the Venz 26 before the release, asking him how his session ended up. He said that it had been one of the craziest days in his trading career.